It is the organism's physical properties which directly determine its chances of survival and reproductive output, while the inheritance of physical properties occurs only as a secondary consequence of the inheritance of genes. Therefore, to properly understand the theory of evolution via natural selection, one must understand the genotype–phenotype distinction. The genes contribute to a trait, and the phenotype is the observable expression of the genes (and therefore the genotype that affects the trait). Say a white mouse had the recessive genes that caused the genes that cause the color of the mouse to be inactive (so "cc"). Its genotype would be responsible for its phenotype (the white color). 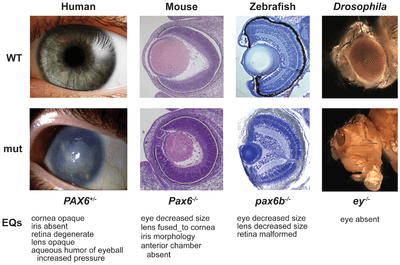 Similar genotypic changes may result in similar phenotypic alterations, even across a wide range of species. An organism's genotype is a major (the largest by far for morphology) influencing factor in the development of its phenotype, but it is not the only one. Even two organisms with identical genotypes normally differ in their phenotypes. One experiences this in everyday life with monozygous (i.e. identical) twins. Identical twins share the same genotype, since their genomes are identical; but they never have the same phenotype, although their phenotypes may be very similar. This is apparent in the fact that their mothers and close friends can always tell them apart, even though others might not be able to see the subtle differences. Further, identical twins can be distinguished by their fingerprints, which are never completely identical. The concept of phenotypic plasticity defines the degree to which an organism's phenotype is determined by its genotype. A high level of plasticity means that environmental factors have a strong influence on the particular phenotype that develops. If there is little plasticity, the phenotype of an organism can be reliably predicted from knowledge of the genotype, regardless of environmental peculiarities during development. An example of high plasticity can be observed in larval newts1: when these larvae sense the presence of predators such as dragonflies, they develop larger heads and tails relative to their body size and display darker pigmentation. Larvae with these traits have a higher chance of survival when exposed to the predators, but grow more slowly than other phenotypes. In contrast to phenotypic plasticity, the concept of genetic canalization addresses the extent to which an organism's phenotype allows conclusions about its genotype. A phenotype is said to be canalized if mutations (changes in the genome) do not noticeably affect the physical properties of the organism. This means that a canalized phenotype may form from a large variety of different genotypes, in which case it is not possible to exactly predict the genotype from knowledge of the phenotype (i.e. the genotype–phenotype map is not invertible). If canalization is not present, small changes in the genome have an immediate effect on the phenotype that develops. The terms "genotype" and "phenotype" were created by Wilhelm Johannsen in 1911. (adapted from Lewontin 1974, p. 12). T1 represents the genetic and epigenetic laws, the aspects of functional biology, or development, that transform a genotype into phenotype. We will refer to this as the "genotype-phenotype map". T2 is the transformation due to natural selection, T3 are epigenetic relations that predict genotypes based on the selected phenotypes and finally T4 the rules of Mendelian genetics. In practice, there are two bodies of evolutionary theory that exist in parallel, traditional population genetics operating in the genotype space and the biometric theory used in plant and animal breeding, operating in phenotype space. The missing part is the mapping between the genotype and phenotype space. This leads to a "sleight of hand" (as Lewontin terms it) whereby variables in the equations of one domain, are considered parameters or constants, where, in a full-treatment they would be transformed themselves by the evolutionary process and are in reality functions of the state variables in the other domain. The "sleight of hand" is assuming that we know this mapping. Proceeding as if we do understand it is enough to analyze many cases of interest. For example, if the phenotype is almost one-to-one with genotype (sickle-cell disease) or the time-scale is sufficiently short, the "constants" can be treated as such; however, there are many situations where it is inaccurate. ↑ Johannsen, W. (1911). "The Genotype Conception of Heredity". The American Naturalist. 45 (531): 129–159. doi:10.1086/279202. JSTOR 2455747. ↑ Lewontin, Richard C. (1974). The genetic basis of evolutionary change ([4th printing.] ed.). New York: Columbia University Press. ISBN 978-0231083188.